I have tried CITAVI a bit and I like the possibility to tag individual text highlights and was therefore wondering what is the ideal piece of hardware (ereader or tablet) to use for an easy and clean workflow. Basically I need to read articles and ebooks (both epubs and pdfs, some are A4) on the device, highlight passages and at the same time tag the highlights, and eventually add some note here and there. Only afterwards I would like to import everything in CITAVI, with the software recognizing the text underlined and the tags in order to avoid double work (tagging both on the reader and the PC), so that I can focus on research proper with the help of CITAVI. I would like to know what device is best suited and how specifically the workflow would be. p.s. at present I have a 9" PocketBook that allows text highlighting (highlights are stored ad an html file, one per ebook/article), but I am ready to buy a new one in case there is a smooth workflow. Thanks very much for your question! Generally, hardware shouldn't matter much, but we would recommend a tablet rather than an e-reader, since e-readers don't usually offer very good PDF functionality. Otherwise, the program you use to work with PDFs is actually more important than the hardware. Here our main recommendation would be to pick something that works well with a cloud storage solution such as OneDrive or DropBox so that you can access your PDFs from anywhere. 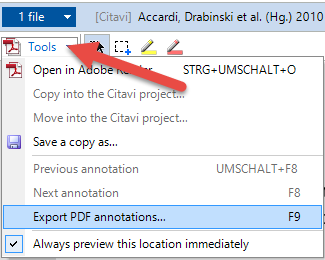 A couple of caveats: you wrote that you want to tag highlights and add notes before adding PDFs to Citavi and that you would like to do the same with epubs. At least as Citavi 5 is right now, it's only possible to import highlights from PDFs. 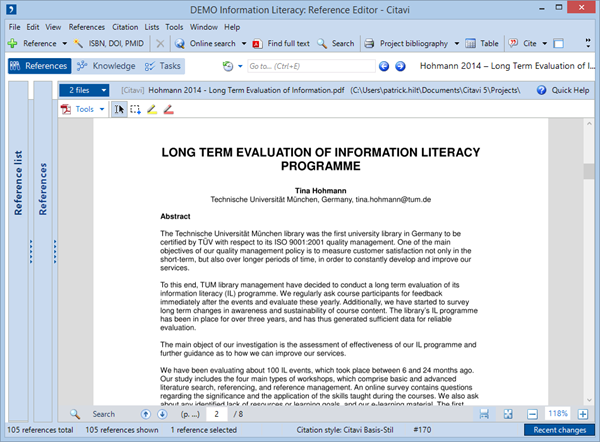 So, you can add highlights to PDF articles in an external program and then import the PDF and its highlights into Citavi. Once you have the PDF in Citavi you can then work with it in additional ways. Hope this helps! If you have any follow-up questions, please just let us know! I was also wondering if Citavi works natively on tables (android? windows10?) and if tests have been made to see how smoothly. My primary concern is that highlights WITH tags (that inputed in an external software would probably have to be "technically" notes or comments, since Citavi is one of the few pieces of software that allows tagging of highlights, this could perhaps an interesting feature to add to Citavi in future version, i.e. comment/tagging recognition) are imported correctly (i.e. don't have to assign again inside Citavi tags to highlights) and this is why specifically I am thinking about Citavi working natively. It would also be nice to have some advice on low-medium range devices that are known to work well with Citavi (would go for an Ipad, but it is out of my range). The tagging recognition would indeed be an interesting feature! I'll add this to our wish list. As Citavi is currently, any computer running Windows Vista, Windows 7, or Windows 8 will work well. 1) The only pdf picker that seems to be available is Adobe Reader 11, which is rather ugly and not as touch-friendly as Reader DC. I could live with that, but the reader - ridiculously - does not seem to support rectangular selections on a page, which makes it impossible to select images and save them as image quotations, which is a feature I need for formulas and tables. 2) It is impossible to actually annotate pdf the way you would normally do it, with notes and highlights and rectangular selections, and then transfer them to Citavi. The picker does not recognize even a highlight as something potentially to be imported - only a bare selection. As a new Citavi user, I have plenty of pdfs that are already annotated, so this is very frustrating to have to manually select all of them again. 3) If you try to open a pre-annotated pdf in preview and click through the highlights made in an external program (which could be acceptable workflow to assign categories etc.) - they disappear from the document as soon as they become Citavi knowledge items!!! That is not good at all for the scenario when several people read pdfs together and comment on them. And, lastly - my 8-inch Windows 8 tablet is just not big enough to run Citavi comfortably. You cannot select to hide references and knowledge tabs to just read in the preview mode. Thank you very much! Your comments are very helpful to understand how people want to work and what they need. First of all, please download the latest beta version, Citavi 5 Beta 5 (4.9.6.215). I believe the version you installed does not have the functionality yet to import highlights from external programs. This cannot be done automatically, I am afraid, but only individually per highlight. Does this layout not work on your 8-inch tablet? Please keep in mind that for the time being only the colour highlights of knowledge items are exported into the PDF document, but not the texts of summaries or comments. Citavi 5 has not been made with touch devices in mind. This would have required a major overhaul which was not possible for version 5. Citavi for Web, on the other hand, is developed to be used with both touch and non touch devices. Thank you for helping to make Citavi better. 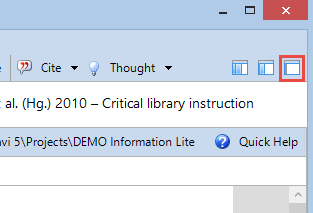 Citavi works with Acrobat Reader DC, too. Since it is brand new, our setup does not recognize it yet. Thank you, I was able to try version 4.9.6.2.18 with Reader DC, and with the right-pane-only view! Editing window problem. I have to click o the sliding bar between the central and right panels to open the central panel in all the available screen space, and then I can see the quotation I just made - but it is in the list of quotations, not in the edit window. I can open the pop-up editing window in two clicks, or double click on a quotation and bring up the mini-editing window. The latter is a more tablet-friendly scenario, but the editing menu within the quotation list is too small in the tablet screen, so ideally this behavior (Enter for edit, Alt+Enter for edit in window) should be allowed to be set maually to the reverse key bindings. Even better for tablets, there could be an option for the "create quotation" command to bring up the edit-quotation pop-up window, as it does from the Adobe Reader picker. The pop-up window itself also could also be improved, though. Too much space is used by the tips area on the right, and it is hard to see the text of the quotation. Remove-linebreaks button: in the tablet situation, there is often no hardware keyboard - and so removal of line breaks in a quotation requires clicking through the menu. It would be more convenient if there was a button for that right in the edit-quotation window. I hope this does not sound like I am finding faults with Citavi. This is a great tool, and I think that tablet compatibility is something worth thinking about - the researchers will want to read and annotate on the tablets! Since there already are Windows tablets, and some of them support styluses which make it easier to deal with desktop programs, Citavi could probably do the job without much overhauling of interface. This is what I do myself; my tablet has a stylus pen, and I can work with my regular desktop programs like Word for quick editing on the go. Citavi could be perfectly useable this way, especially with the right-pane-only mode for reading. The text selection in Citavi is much more precise than in Reader DC, and there is the great option to add any part of document as an image quotation. It is just that the layout of the add-quotation pop-up window needs to adapt itself for "tablet" resolutions (mine is 800 x 1280, for example), and there should be an option for pop-up quotation window or left-panel editing when additing a quotation from the Citavi viewer. Thank you very much for you tests and your suggestions. We are aware that Citavi 4 and 5 as it is are not really tablet enabled. Still, your tests seem to indicate that the reading and annotating functions could be used on a tablet. We are going to adapt the behaviour if only the preview pane is shown when you add a quotation. In this case, the quotation will always open in a pop-up window. We are also going to discuss the possibility to add a button for the removal of line breaks. Thank you very much! I just played with Citavi a bit more on my tablet; I love the function of adding the red highlight (saves so many clicks! ), but here, too, the pop-up window should come up automatically if the user makes the red highlight in the preview-only mode. Furthermore: the behavior for adding comment, indirect quotation, and summary are all the same, right? Perhaps they should all be adapted to bringing up their respective pop-up windows, if evoked in the preview-only mode. Image quotation seems to already work this way. These pop-up windows will really help a lot the tablet users, and even more so if it is possible to add the button for removing breaks from the quotation text (without text selection - just removing line breaks from whatever text is in the quotation part of the window). Such a button button would be useful for non-tablet users, too, I think. Of course the keyboard shortcut is the fastest way to do it - but we all know plenty of people who just have to do everything with the mouse!